China vs US: Who is winning the big AI battle? China and the US are becoming the world’s biggest rivals in artificial intelligence: it’s Luke vs Darth Vader, Alien vs Predator, Rocky vs Ivan Drago. The Chinese government’s pivot to become the leader in this technology has created plenty of hype, but how are China’s ambitious AI aspirations playing out on the ground? Research by startup database IT Juzi and Tencent News offers a new view of China’s AI industry’s strengths and weaknesses. The US is currently the definite champion in AI development, according to the data. There are 1.82 times more American AI companies than Chinese. Investments in the US are 1.54 higher than in China and the talent pool is 2.01 times larger. Out of the total number of AI companies in the world (2542 according to data from June 2017), the US hosts 42% of them, while China ranks second with 23%. The two countries beat Britain, Australia, Japan, Sweden, Singapore and other developed countries. These strong AI foundations were built with the help of companies such as Google, Amazon, IBM, and Microsoft which started their ascendance early. But that gap could close soon: China’s tech trinity BAT is also building its AI ecosystems. There is Baidu’s AI assistant/platform DuerOS, self-driving platform Apollo and deep learning platform Paddle Paddle. Alibaba has its Platform of Artificial Intelligence (PAI 2.0), the Tmall Genie voice assistant, and customer service chatbot Dian Xiaomi. Tencent has developed a cloud service, an open-source computing platform called Angel, Wechat AI, and robot reporter Dreamwriter. Giants aren’t the only ones wrestling in the ring: AI companies in China are springing up like bamboo shoots after a spring rain. “China’s artificial intelligence can basically rival the world’s, but the dividends brought by industrial revolutions over the past 10 years will eventually be gone,” said Yao Qizhi, the first Asian winner of the Turing award, adding that supercomputers and theory are China’s biggest shortcomings. These are not the only areas lagging behind the US, according to the report. A major impediment is the lack of AI talent. The numbers show that the US AI talent pool is 78,000-strong, while in China, that number is more than half lower—it has 39,200 AI experts. The reason behind this is the lack of quality training: out of the top 20 universities in the world in AI, 16 are affiliated to the US. Current academic capacities in China simply do not meet the demand. The divide is also visible within the industry: China’s AI development will have to bridge the technology gap while paying attention to product differentiation and market demand. These are the three thresholds for AI startup development, the report states. Chinese and American AI experts will have plenty of opportunities for a rematch. The most important areas in AI in the near future will be network security and fraud prevention, unmanned convenience stores, machine translation, the medical and pharmaceutical industry, and intellectual right protection. The two countries are currently building their strengths in different fields while AI startups are growing with their local financing trends. 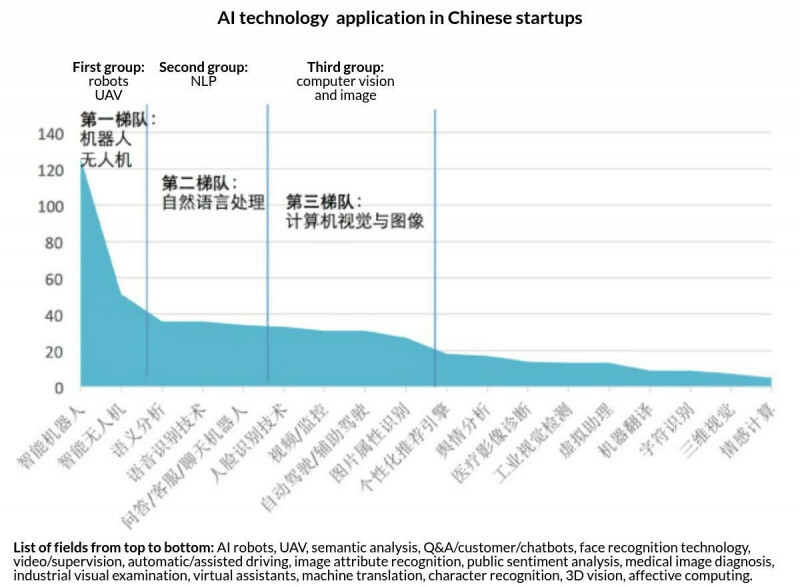 Here are some more interesting numbers on China’s AI industry from the “2017 China-US AI Venture Capital State and Trends Research Report” (2017中美AI创投现状与趋势研究报告). What are Chinese and American AI companies researching? Thanks to advances in three crucial areas for AI development—algorithms, data and high-performance chips—the world is discovering new applications in the field. In China, the most popular growth areas are proving to be smart robots with companies such as Ubtech, Roobo, and Cloudminds, as well as unmanned areal vehicles (UAV) with drone giant DJI as the biggest player in the field. Natural language processing (NLP), including semantic analysis, speech recognition, and chatbots have also proven a hot spot with Jinri Toutiao, iFlytek and Unisound as some of the more famous representatives. The third popular category—face and image recognition—hosts companies such as Face++ and SenseVision. It covers video surveillance, automatic driving, and computer vision. But what are China’s AI strengths comparing to the US? The research lists nine areas in AI according to the difficulty of starting a business. For instance, NLP and computer vision have lower technical difficulty, which is why this area is a common hotspot both in China and the US. The most difficult part of AI is processor and chip development due to the amounts of funding needed, long cycle of development, and fewer talents. 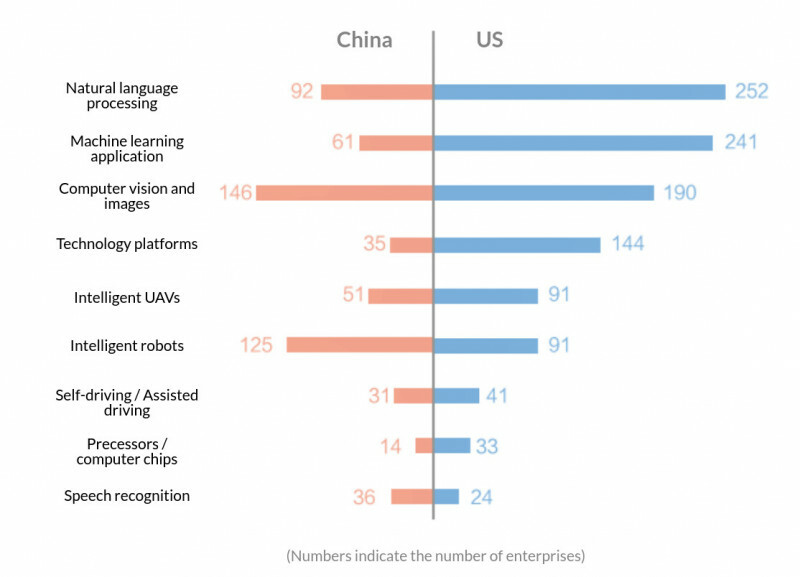 According to the research, China’s main strength lies in intelligent robots, while the US stands as the world’s machine learning application champion. What industries are most affected by AI in China? 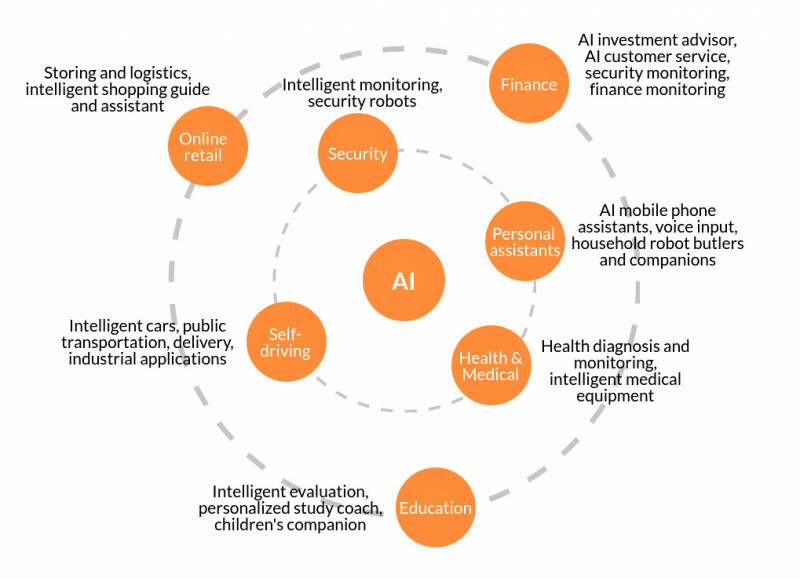 In China, the medical industry has become an interesting area for AI applications, including medical imaging and medical record analysis. This field has so far largely benefited from weak artificial intelligence, a form of AI specifically designed to focus on narrow tasks. The automobile industry ranks second with self-driving and assisted driving, followed by education, finance, manufacturing, security, home and other industries. How much money does the AI industry get? 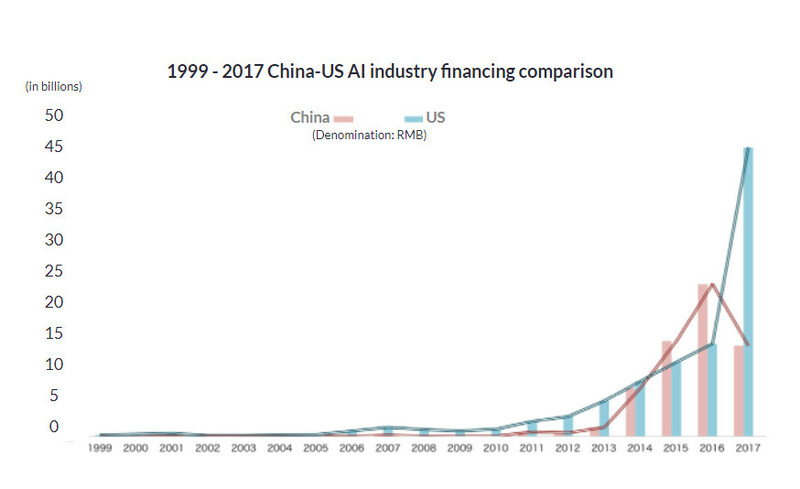 Since the first AI investments in the US in 1999, the amount invested in AI globally has risen to RMB 191.4 billion. As of June 31st, 2017, Chinese AI companies received RMB 63.5 billion or 33.18% of the world’s AI funding, The US takes the lead with 51.10% (RMB 97.8 billion), while the rest of the world carved up the remaining 15.73%. In 2016, China managed to edge closer to its main rival, but thanks to several big deals in the US, China’s total AI financing significantly lagged in H1 2017. Another interesting piece of data is that China has a higher percentage of AI companies that have received investments (69%) than the US (51%). This shows that the main problem for AI development in China is not the lack of funds but the lack of technology and talent. Image credit: China has a higher percentage of AI companies that have received investments (69%) than the US (51%).